[168 Pages Report] Rotogravure Printing Inks Market size is estimated to reach USD 4.30 Billion by 2021, registering a CAGR of 4.99% between 2016 and 2021. In this study, 2014 has been considered as the historical year and 2015 as the base year for estimating market size, while the forecast period is between 2016 and 2021. 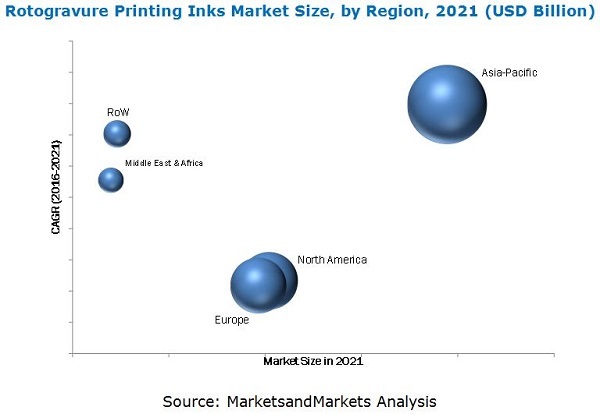 This report aims to estimate the size and future growth potential of the rotogravure printing inks market across different segments such as resin type, technology, application, and region. 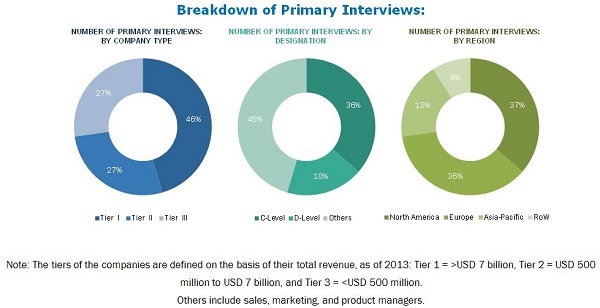 The study also covers factors such as drivers, restraints, opportunities, and industry-specific challenges that are influencing the market growth and analyzes the opportunities for stakeholders in the market. It also presents the competitive landscape for the market leaders during the forecast period. Both, top-down and bottom-up, approaches have been used to estimate and validate the size of the global market and the sizes of various other dependent submarkets in the market. The research study involved the use of extensive secondary sources, directories, and databases such as Hoovers, Bloomberg, Chemical Weekly, Factiva, National Association of Printing Ink Manufacturers (NAPIM), Canadian Printing Ink Manufacturers' Association (CPIMA), International Paint and Printing Ink Council (IPPIC), and other government and private & company websites to identify and collect information useful for the technical, market-oriented, and commercial study of the global rotogravure printing inks market. The rotogravure printing inks market has a diversified and established ecosystem of its upstream players such as the raw material suppliers and the downstream stakeholders such as the manufacturers, vendors, end users, and government organizations. Flint Group (Luxembourg), DIC Corporation (Japan), and Toyo Ink SC Holdings Co., Ltd. (Japan), are the manufacturers of rotogravure printing inks and also major raw material suppliers. The major industries where these manufacturers supply rotogravure printing inks include packaging, publication, product, and promotion. This research report categorizes the global rotogravure printing inks market on the basis of resin type, technology, application, and region. Country-level analysis of the rotogravure printing inks market by application. The global market size of rotogravure printing inks is projected to reach USD 4.30 Billion by 2021, registering a CAGR of 4.99% between 2016 and 2021. The growing manufacturing and end-use industries and the increasing flexible packaging application is driving the demand for rotogravure printing inks in the Asia-Pacific region and also the continuous product development, expansion, and merger & acquisition activities undertaken by companies are the key factors driving the global rotogravure printing inks market. In 2015, the packaging segment accounted for the largest market share, in terms of value, followed by the publication and product segments. The market in the packaging segment is estimated to witness the highest CAGR between 2016 and 2021, in terms of value, because of the demand for online shopping is increasing in the emerging countries. Similarly, labels, plastic bags, and invoice are used for packaging which eventually drives the market. Nitrocellulose is currently the dominant resin type in the rotogravure printing inks market, while polyamide resin type is estimated to witness the highest CAGR between 2016 and 2021. The rising demand for rotogravure printing inks is mainly driven by its increasing use in the packaging application and its rising demand from the developing countries such as India, China, and Brazil. Asia-Pacific is also expected to witness the highest growth rate in the market, in terms of value and volume, between 2016 and 2021. Rising investments by foreign companies; growing production facilities; strong industrial base for the packaging, publication, and product sectors; and improvement in standard of living are the other major factors driving the rotogravure printing inks market in this region. The steady rise of digital media has shrunken the print media market. Owing to this many players have shifted at least half of their marketing spending from traditional to digital advertising over the last few years. Printing ink consumption is declining due decreasing demand of published books, printed newspapers, and catalogues and increasing interest toward the internet, electronic publishing, more usage of mobile phones, and other electronic devices. Companies such as Flint Group (Luxembourg), DIC Corporation (Japan), Toyo Ink SC Holdings Co., Ltd. (Japan), Dainichiseika Color & Chemicals Mfg. Co., Ltd. (Japan), Sakata Inx Corporation (Japan), T&K Toka Co., Ltd. (Japan), Tokyo Printing Ink Manufacturing Co., Ltd. (Japan), Siegwerk Druckfarben AG & Co. KGaA, (Germany), Hubergroup Deutschland GmbH (Germany), and Wikoff Color Corporation (U.S.) among others are the dominant market players in the global rotogravure printing inks market. The diverse product portfolio and strategically positioned R&D centers, continuous adoption of development strategies, and technological advancements are few factors that are responsible for strengthening position of these companies in the market. They have been adopting various organic and inorganic growth strategies to enhance the current market scenario of rotogravure printing inks.